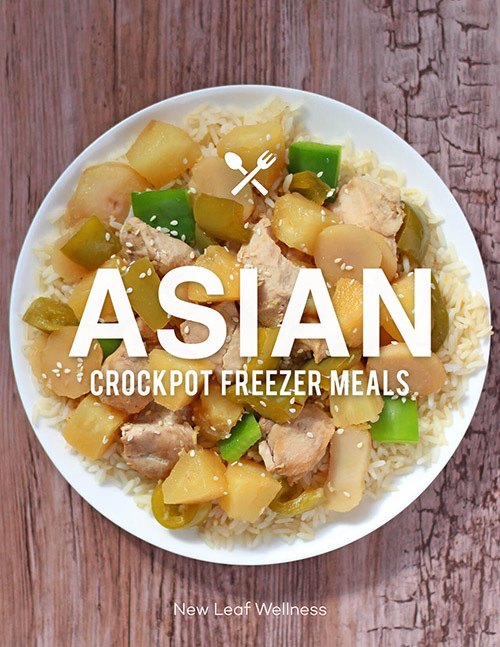 I could not be more excited to share my brand-new Asian Crockpot Freezer Meals Cookbook with you. My cousin Jill and I worked on the recipes for months and I think it’s my best eBook yet. 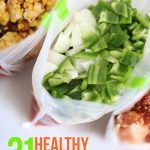 What’s inside my Asian Crockpot Freezer Meals mini eCookbook? Since the meals are frozen without any cooking ahead of time they taste exactly like freshly prepared meals and not like leftovers at all. Yum! Is the recipe so delicious that I want to make it over and over again? Is the recipe as healthy as possible without sacrificing taste? Is the ingredient list simple and budget-friendly? I know that every recipe that passes this test will be a winner. Then I obsess over the nutritional info, grocery list, filled out freezer labels, and and every other detail in the eBook until I am confident that it is my very best work. There are times when I feel crazy pouring so much of myself into a $2.99 product, but I know your resources are valuable and I want you to get more than your money’s worth. I sold over 18,000 eBooks last year and I continue to be humbled by your support. Everyday people email me and leave comments on my blog about how crockpot freezer meals have changed their life. No. My cousin Jill and I wrote the recipes together and bought all of the ingredients at a local grocery store chain. If you live in a very rural area or like to shop at stores with a limited selection (like ALDI or Costco), you will find links in the eCookbook to products that you can buy on Amazon. 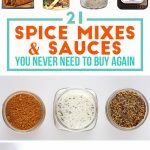 Are all of the recipes spicy? No. 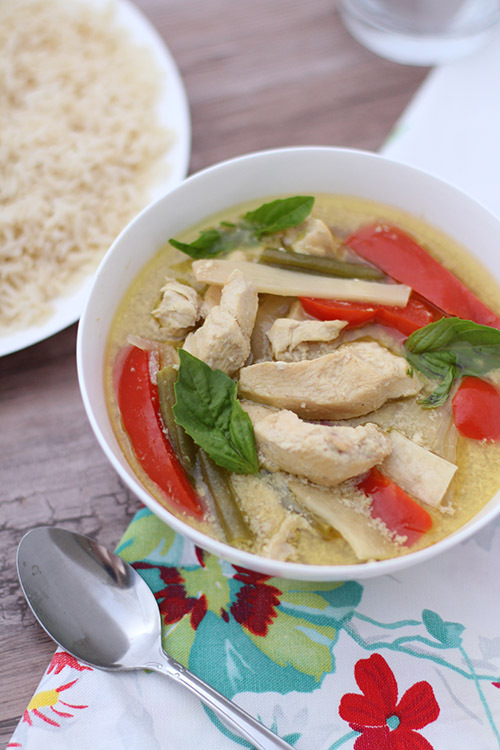 These recipes aren’t any more spicy than the other ones on my blog. You have total control over the spices when you’re making the meals so you can add more or less to your family’s liking. Feel free to err on the side of caution and then taste-test before serving. You can always add more at that point. Will the veggies be crisp or soft and mushy? I wouldn’t say they get “mushy”, but we like cooking our vegetables in the crockpot because they get a little bit softer and absorb all of the flavors of the sauce. Jill and her family like crunchier vegetables so they wait to add them until the last 30 minutes of cooking (You can freeze them separately in a smaller bag). You can also choose to cook your freezer meals in a wok or pot instead of a crockpot. The average cooking time with this method is 15 minutes. 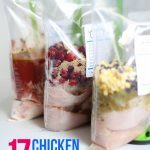 Do I have to freeze the meals before cooking? No. 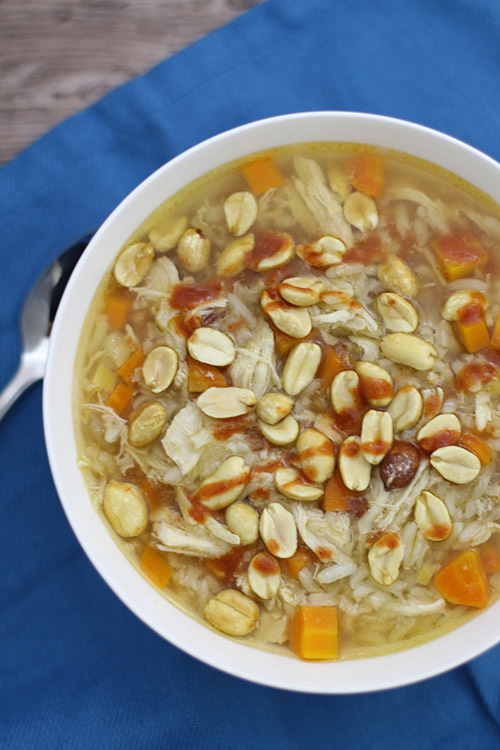 You can add them straight to your crockpot instead. Are these authentic Asian recipes? I would say they’re “Asian-inspired.” To be honest, Jill and I aren’t expert Asian chefs, but we did a bunch of research online, ate a ton of take-out, and attended an Indian cooking class. We also made and re-made the recipes until we thought they were delicious, family-friendly, and affordable. I think that they’re healthy because they include vegetables, fresh meats, and very few processed foods, but it will depend on your definition of healthy. Once you have access to the recipes and nutritional information you can make the substitutions needed to fit your family’s diet. 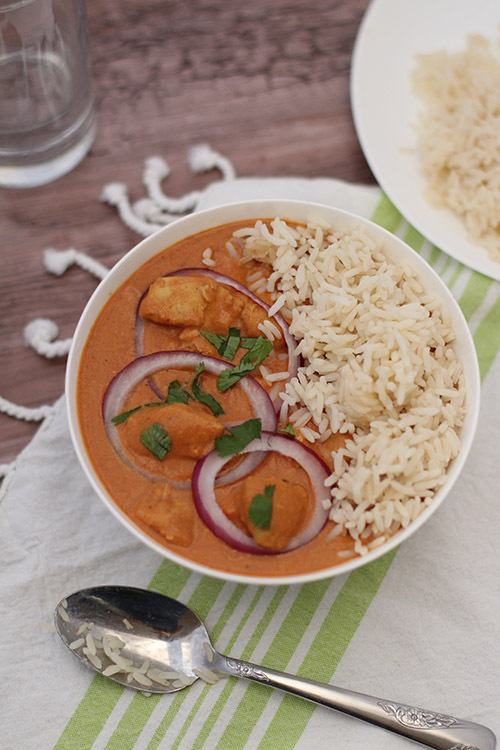 For example, heavy cream is used in the butter chicken, but you can substitute half and half. I also recommend using low sodium soy sauce to keep the sodium level around 33% of the recommended daily value. 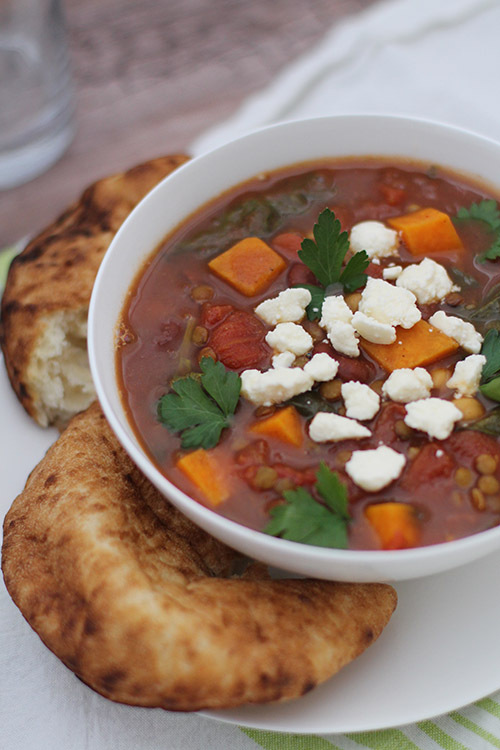 I can promise you that these recipes are delicious and MUCH healthier than take-out. Do you cook the noodles or rice right in the crockpot? 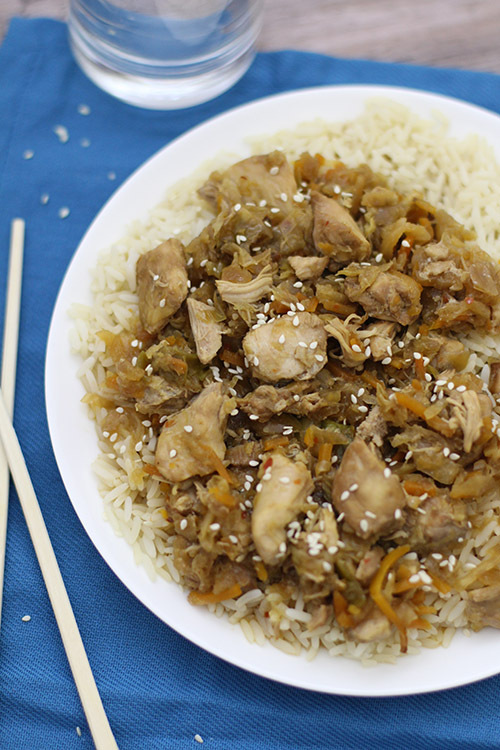 We cook rice in a pan or rice cooker and serve it as a side dish with the rest of the meal. I recently bought a programmable rice cooker and it’s amazing. Most of the meals need to cook 4-8 hours. What should I do if I’m out of the house for longer than that? Most recipes will cook perfectly in 4 hours on “low” in a 6-quart crockpot or 8 hours on “low” in a 4-quart crockpot. If you need to be out of the house longer than that, I highly recommend purchasing a crockpot with a timer that you can program to switch to the “warm” setting after a specified amount of time. (It’s OK for the meal to sit on warm for 4 hours or more.) 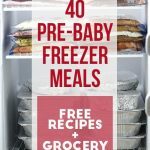 These freezer meals will save you so much money that the crockpot will pay for itself! One last question – What’s an eCookbook? All of my eCookbooks are PDF eBooks that can be read on computers, tablets, and smartphones. (No special e-reader required!) They are also formatted to print on regular 8.5×11″ computer paper so you’re welcome to print a copy if you want. 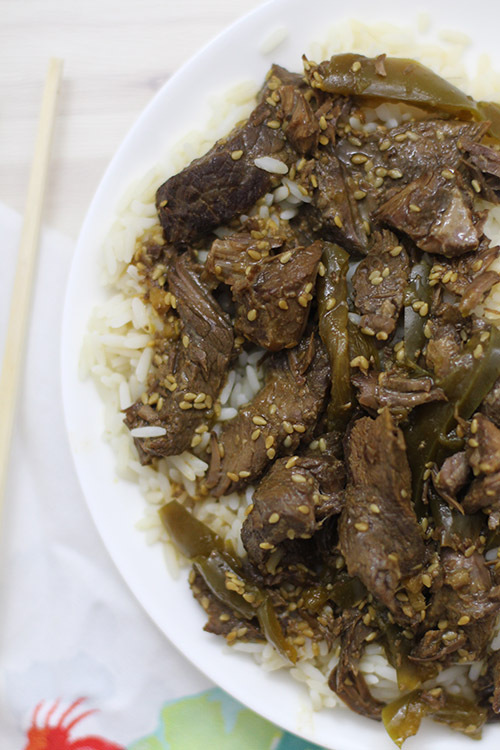 After purchasing your copy of Asian Crockpot Freezer Meals, you will be automatically redirected to a page where you can download your copy of the eBook. You will also be emailed a copy to save to your computer. If you have additional questions, leave a comment below and I’ll respond as soon as I can. Thank you in advance for your support! Love your site and your cookbooks! I just got the new chicken one and the Asian one. I have one question though – the chicken spinach alfredo recipe and the Indian butter chicken recipe both call for heavy cream. what is your experience with cooking the cream for an extended period of time (not adding at end like a lot of slow cook recipes call for)? Is it okay to substitute half and half or will that not cook as well over the long time period? Thanks so much! Heavy cream always works well for me. I keep trying to use yogurt or a mix of the two, and it isn’t as good. I think half and half is a good substitute if you’re looking for something with less fat.